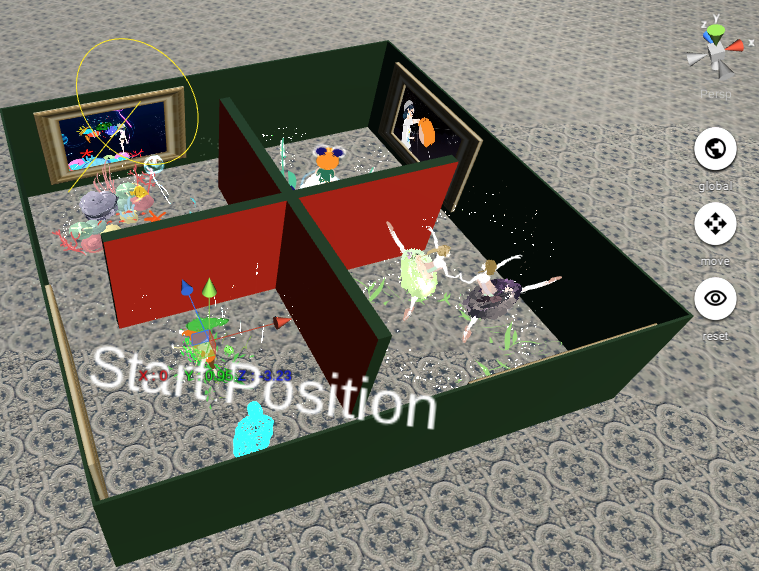 Today, I will introduce how to open a VR solo exhibition in STYLY using the 3DCG software “Blender”. 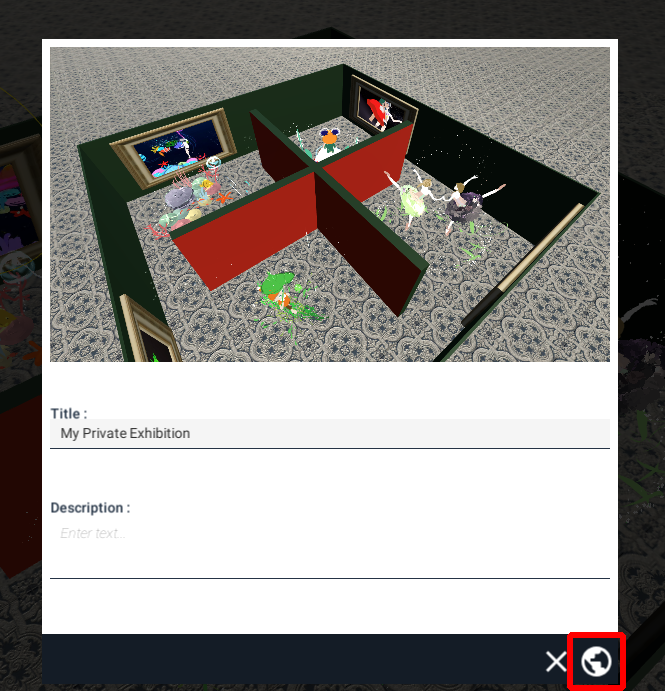 Holding an exhibition in VR means you have no restriction for display space, and it will be accessible for everyone from anywhere. 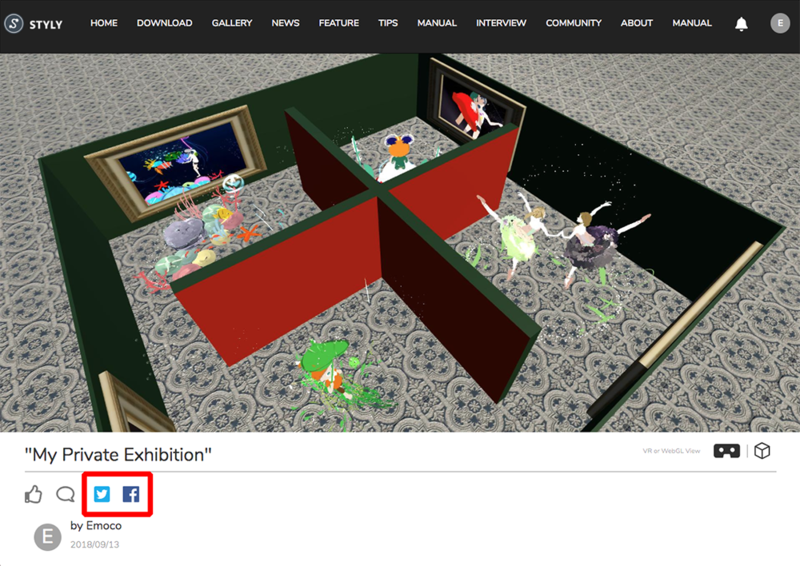 These advantages make VR exhibitions an attractive choice for a portfolio. Even if you are a 3DCG beginner, you will learn how to build an exhibition site from scratch by following this tutorial. I hope you all build and decorate your very own custom exhibition! For those who want to learn how to draw a illustration in VR, please read this article. So, lets start by making a floor-plan for your exhibition site. Don’t forget to think about how and where you want to display your artworks. You could also refer to real buildings and real exhibitions, to get ideas for your exhibition site. One important point is to be careful that the visitors don’t get lost. If the space is too huge, or if the route is hard to find, people won’t be able to look at all your artworks. To prevent such matters, you could place direction signs around, or control where people look next, with moving objects. First, go to the official site for Blender（https://www.blender.org） and click “Download Blender”, then install it to your computer. 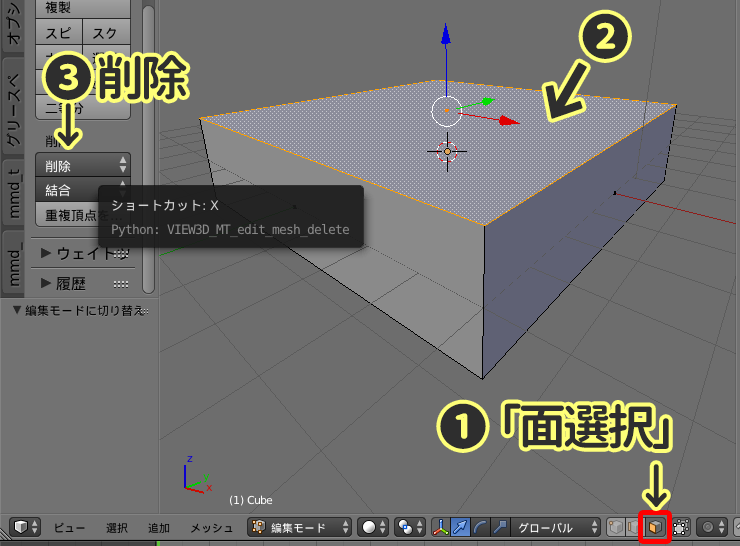 ※ In this article, I will be using Blender v2.79. 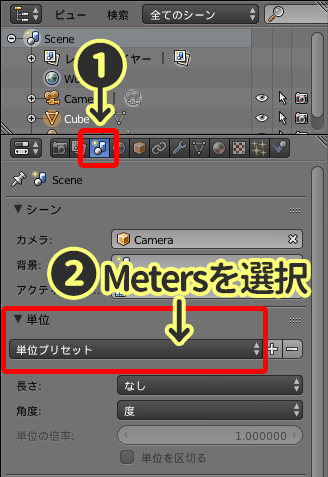 Click the ①”Scene” icon on your right, and change the unit from Unit Presets to ②Meters. Next, we will build the walls for your building. 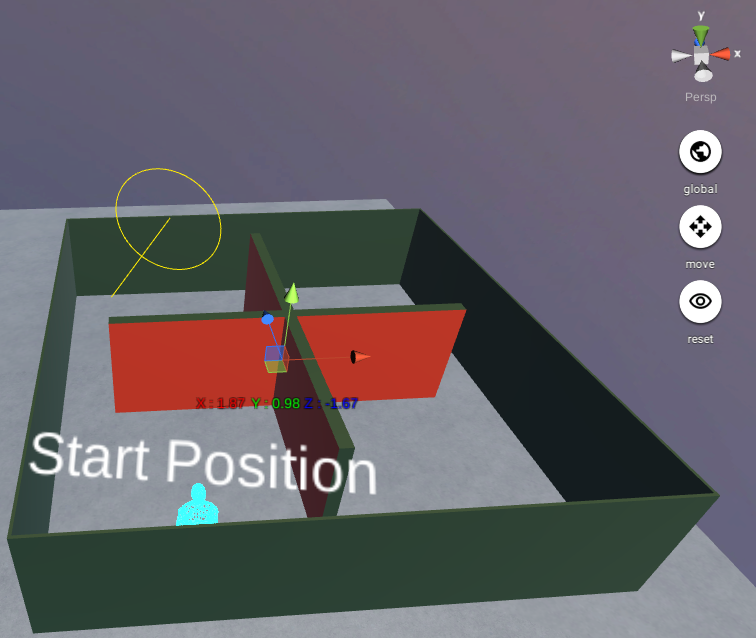 Right click the cube in the center of your screen, so that the cube edges become highlighted in orange. 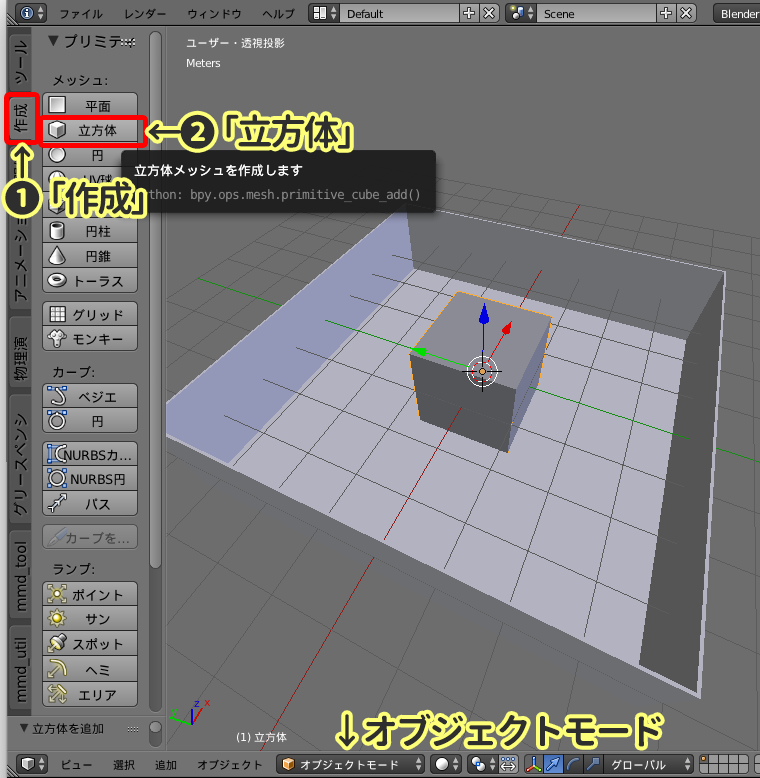 Click the ①“+ icon”, or press the “N” key to show the properties tab of the selected cube. 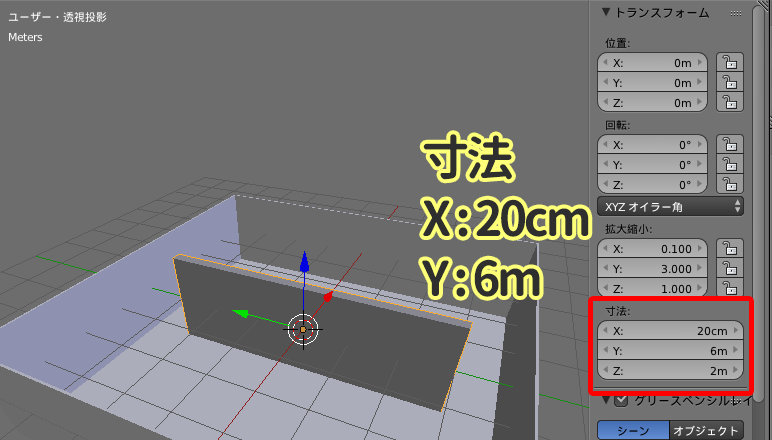 ▼ Change the X and Y value of ②”Dimensions” in “Transform” to 8 meters (or the value you decided for your exhibition site). Click the pull-down menu on the bottom of your screen, and choose “Edit mode”. You can also switch between Edit mode and Object mode by pressing the “Tab” key. When you switch to Edit mode, the object will become highlighted in orange, as in the picture below. By pressing the “A” key you can select, or deselect the current object, so please “deselect” for now. 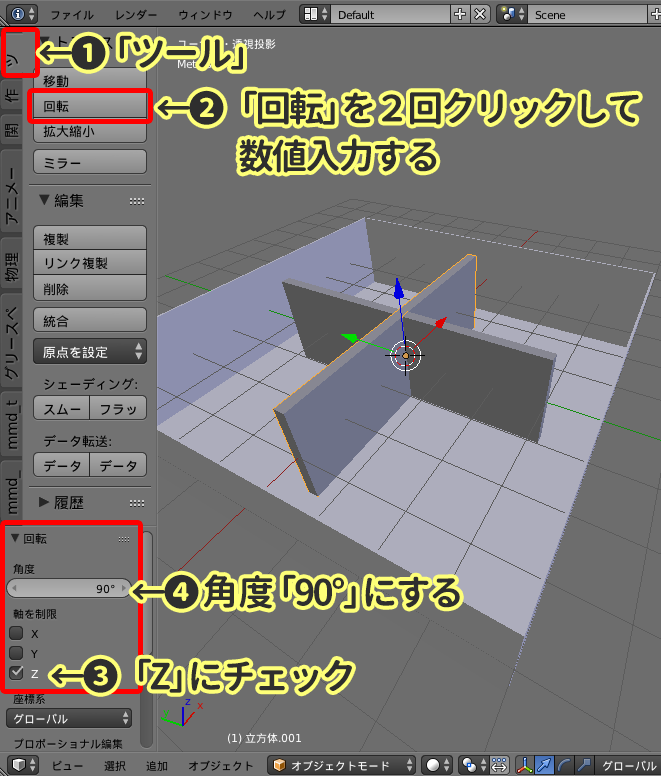 Click the ①”Face select” icon, ②right click the top face of the object, ③click “Delete” (or press the “X” key), and choose “Faces” to delete the top face of the object. ※ There is ground in STYLY too, so you could delete the bottom face too if you want. 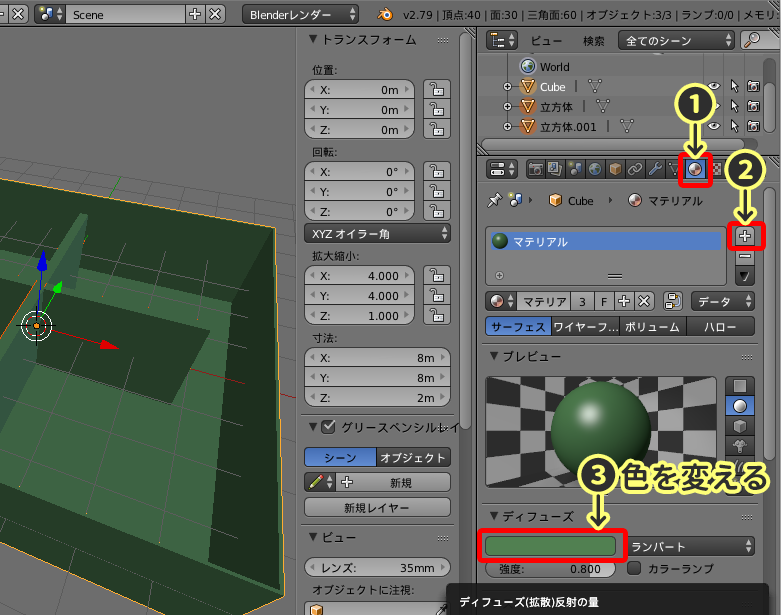 Press the “A” key to select the object, then click ①Mesh >> ②Faces >> ③ Solidify to solidify your walls. 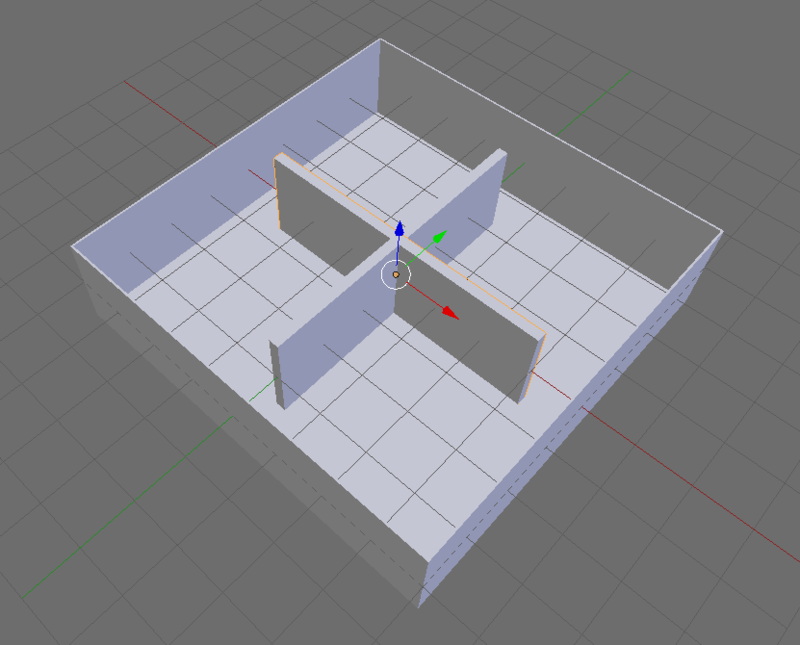 Next, we will create some walls to separate the space in the room. Press the “Shift” key and “S” key, and choose “Cursor to Center”. 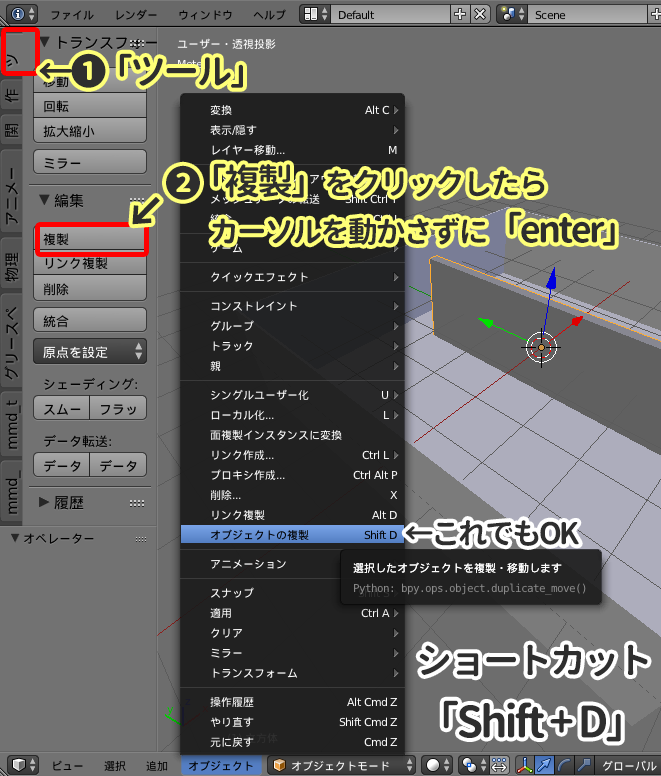 Switch to “Object mode”, click the ①”Create” tab, and click ②”Cube”. 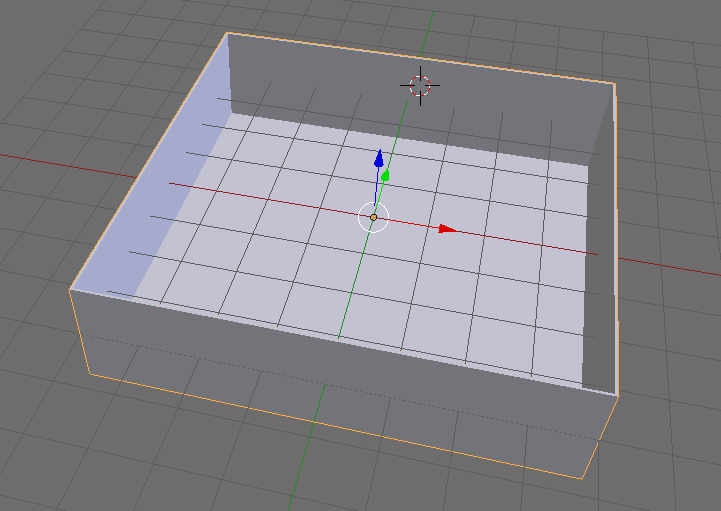 Transform the cube into a thin rectangular. Change the ▼ Transform “Dimensions” to X value = 20cm and Y value = 6m. 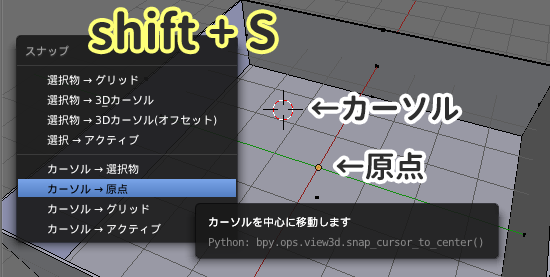 Right click the object, click the ①”Tools” tab, click ②”Duplicate” (or press the “Shift” key and “D” key) to duplicate the object. After you click “Duplicate”, do not move the cursor and press “Enter” immediately. 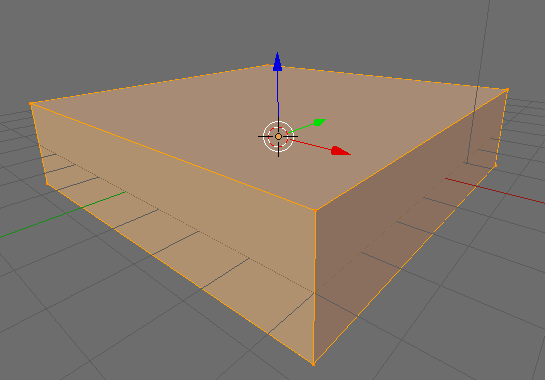 Click the ①”Tools” tab, click ②”Rotate” twice, select the ③”Z” axis, and ④set the angle to 90° to rotate the wall. Switch to “Object mode”, and right click the object you want to change the color of. 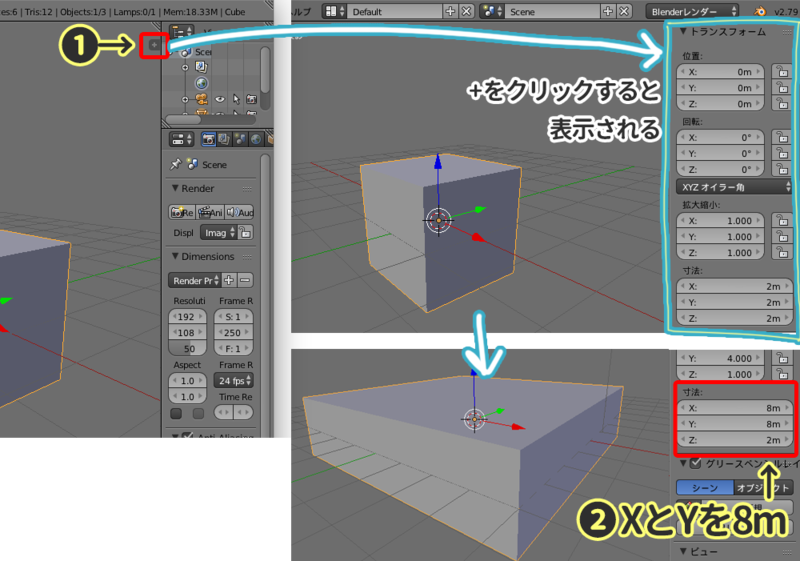 Click the ①”Material Icon”, click the ②”+ icon” to add a new material slot, and change the color of ③”▼ Diffuse”. When you want to change the color partially, switch to “Edit mode”. 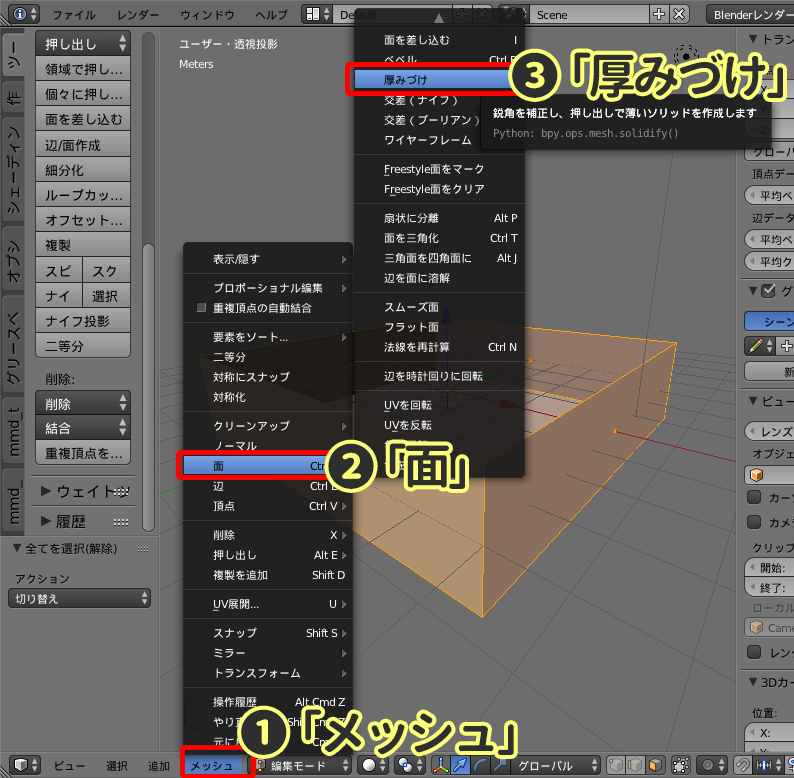 Click the ①”+ icon” to add a new material slot, and change the color of ③”▼ Diffuse”. Select the face you want to change the color of, and click ③”Assign” to assign the color. If there are objects such as “Camera” or “Lamp”, you don’t need them so right click and choose “Delete”. Finally, select “File” from the upper left, and choose “Save”(in .blend format) to save your exhibition site. Access STYLY（https://styly.cc/） from a browser (Google Chrome is recommended) and login or register as a new user. Launch STYLY Editor, select the “Create Scene” tab, enter the name of your work in the “Title” bar, and click “Create”. Once the new scene gets created, click the “photo icon”(Assets) located in the upper left corner of your screen. 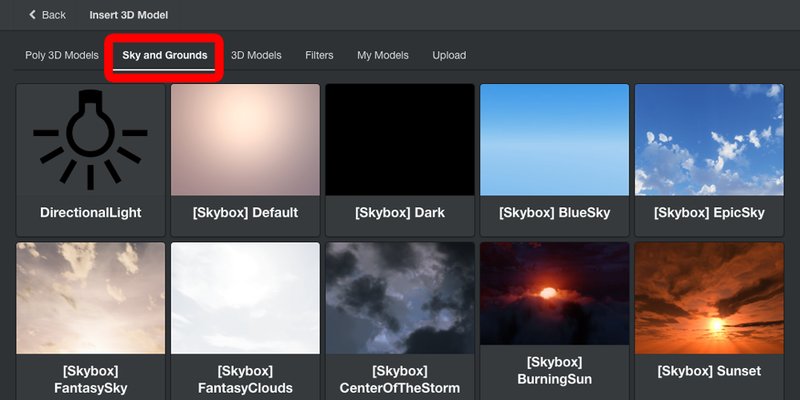 Next, click the “3D Model” icon. 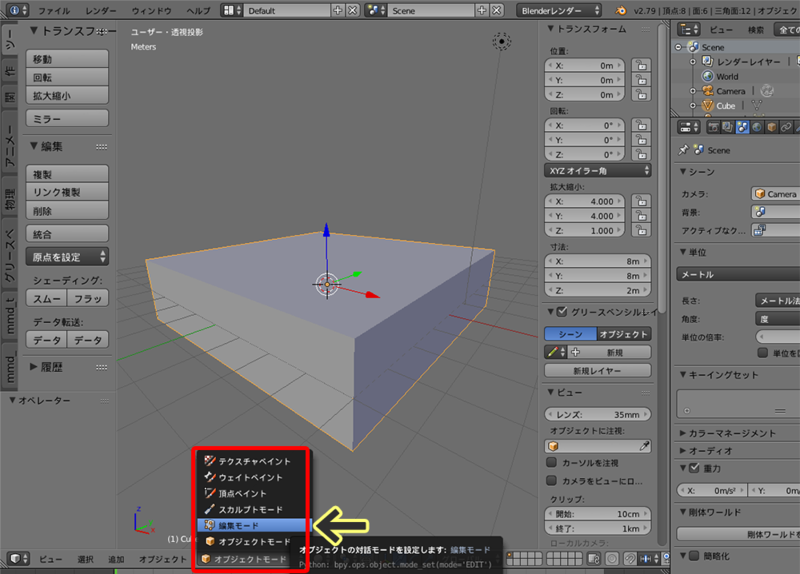 Select the ①”Upload” tab, click ②”Select..”, add the Blender 3D data file you just made, and click the blue ③”Upload” button. 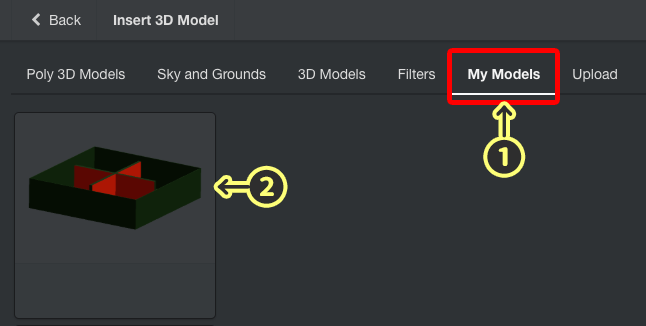 After a short wait, the object will show up in the “My Models” tab, so click it. 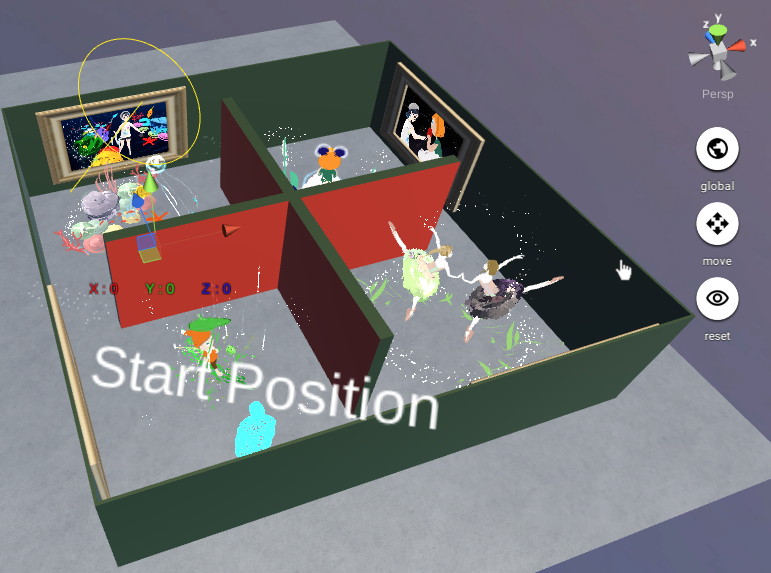 Move the exhibition site with the Start Position(where the user will first be standing) in mind. Read this article to learn how to “move, rotate, change scale” assets in the STYLY Editor. Lets start decorating your exhibition site with your artworks. You can display not only 3D models, but also illustrations or even videos in STYLY. To find out the details for each, refer to the articles below. You can change the sky and ground to match your artwork and fashion. First, click the “photo icon”(Assets). Select the “Sky and Grounds”tab, and choose the sky and ground that best matches your exhibition site. Playing melodic music will create a great atmosphere for your exhibition. Next, click the “Music” icon. 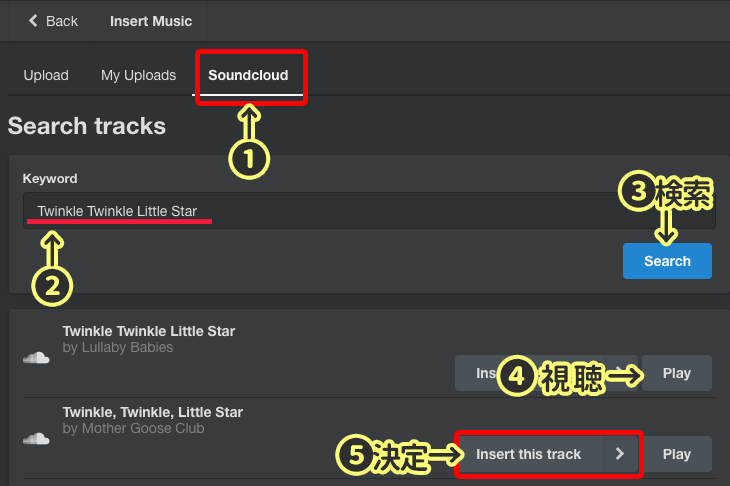 Select the ①”Upload” tab, click ②”Select..” and choose a MP3 file from you computer, and click the blue ③”Upload” button. ※ Make sure to use music you created, or copyright free music. The uploaded MP3 data will show up in the “My Uploads” tab, so click it. Choose either “Loop play”, or “Play only once”. Then, a Music player will be added to the scene and music will start playing. If you don’t have any music files, you can get music from “Soundcloud”. Click the ①”Soundcloud” tab, enter a ②”Keyword”, and click ④”Play” to listen to a sample. Find a song you like, and click ⑤”Insert this track” to add it to your scene. 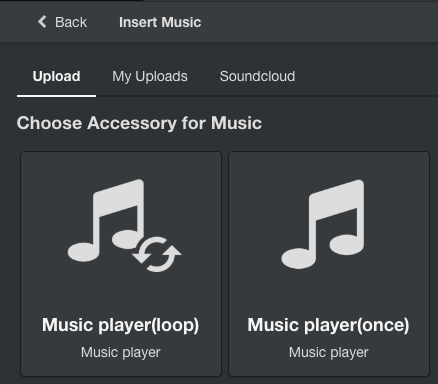 Choose either “Loop play”, or “Play only once” to add a Music player to the scene. Finally, look at the whole scene and arrange your assets so they look best. For those who have a VR HMD, download STYLY from Steam, and check how your scene looks in VR. 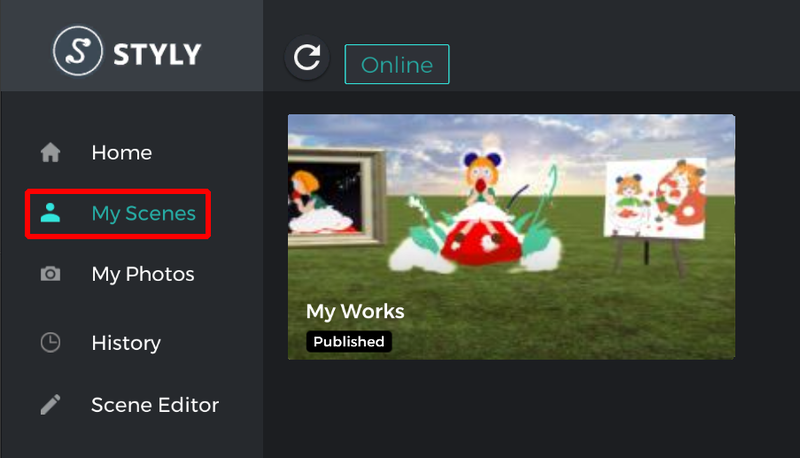 Launch STYLY, and click “My Scenes” to find the scene you created. You will be able to see and check your scene from your VR HMD, so adjust anything you find the need for. When you’re done with the scene, the final step is publishing it. Click the “Earth icon”(Publish) in the upper left of your screen. Enter the title of your work and description, and click the “Earth icon”(Publish) on the bottom right to publish. 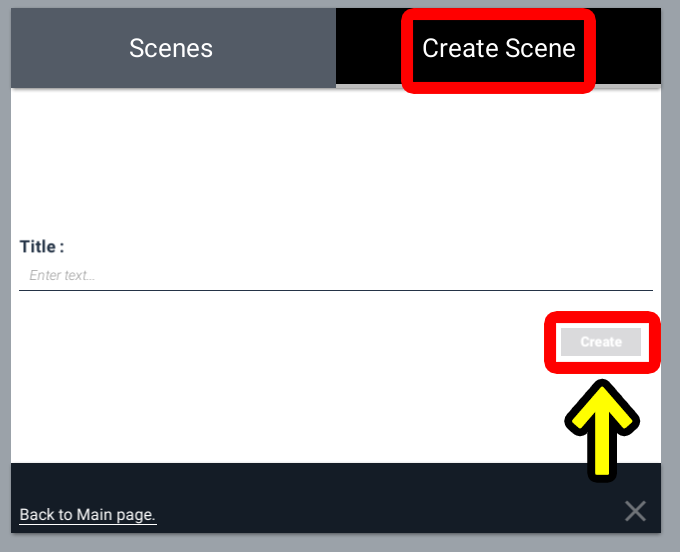 Once the scene is published, a page of your scene will show up, so share your work from SNS services. Even if a user doesn’t have a VR HMD, STYLY scenes can be accessed from a web browser too, so you can show your creation to anyone! Today, I introduced how to create an art gallery using Blender, and opening a VR solo exhibition in STYLY. 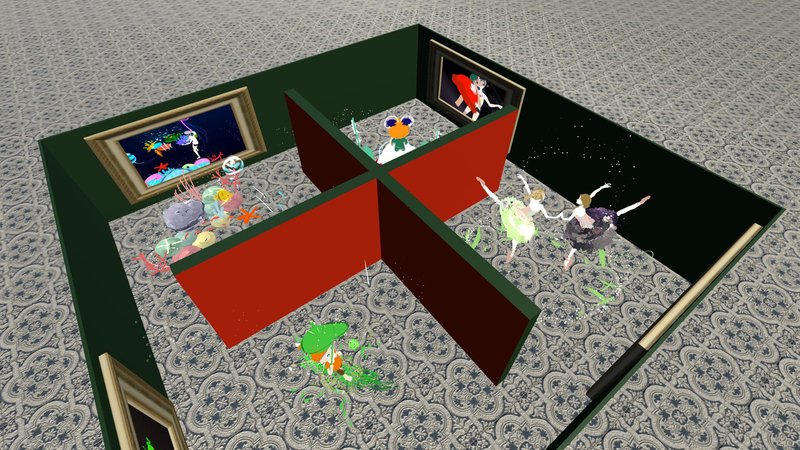 In real life, holding a solo exhibition has many difficulties, but in virtual reality, you can not only hold it throughout the year without any costs, you can also invite anyone in the world. 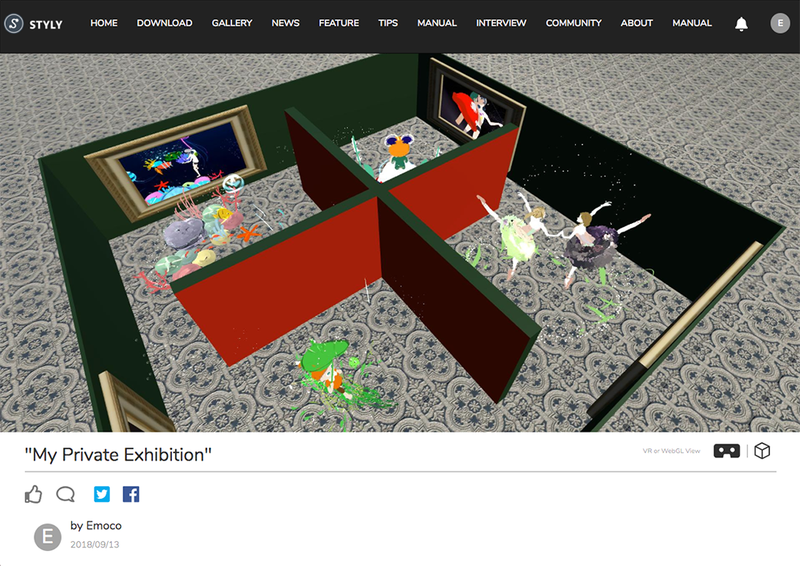 I’m hoping and am looking forward to seeing VR solo exhibitions held by you folks!